Mining Pilot Plants are small scale mining process systems, which generate vital information, which will be, incorporated into the design of larger-scale mining operations. The chemical feed systems used in these pilot plants are not only scaled down as well, but need to accommodate both the rugged environment of a mining operation while possessing the control, versatility, and accuracy typically associated with an R&D laboratory. FMIs valveless, ceramic metering pumps have proven ideal for mining pilot plant applications primarily due to the pumps sapphire-hard ceramic internal components, which are chemically inert, wear resistant, and dimensionally stable. In addition, FMI pumps unique CeramPump® valveless rotating and reciprocation piston pump design eliminates the need for check valves, which can clog, leak or fail over time. These features result in a pump design which can handle a broad range of chemicals under varying conditions with extreme precision and accuracy. 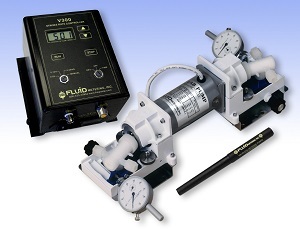 FMIs V-300 System combines FMIs QV Valveless, Variable Speed Pump with the V-300 Control Unit. In the mining industry, the FMI V-300 System is used extensively to pump acids and solvents used in hydrometallurgy in the process area of leaching, as well as solvent extraction. In the uranium extraction process, FMI pumps meter Sulfuric Acid (H2SO4) lixiviant (liquid medium for selective extraction of metal from ore or mineral). A wide variety of solvents are also metered using the V-300 System in the extraction process. For over 55 years Fluid Metering pumps have been used in pilot plant operations, as well as applications which require precision fluid control in medical, analytical, pharmaceutical, water & wastewater treatment, food, semiconductor, alternative energy, environmental monitoring, and much more.